Kentucky (Wildcats, 27,209 students, Lexington, KY) 76, NORTH CAROLINA 69 - On too many occasions this season, North Carolina has gotten behind only to eventually win with determined comebacks. On most occasions, the other team blinks in the face of an intense Tar Heel barrage. Kentucky, who had advanced to the regional final after vanquishing the #1 overall seed in the tournament Ohio State, wasn’t one of those teams. 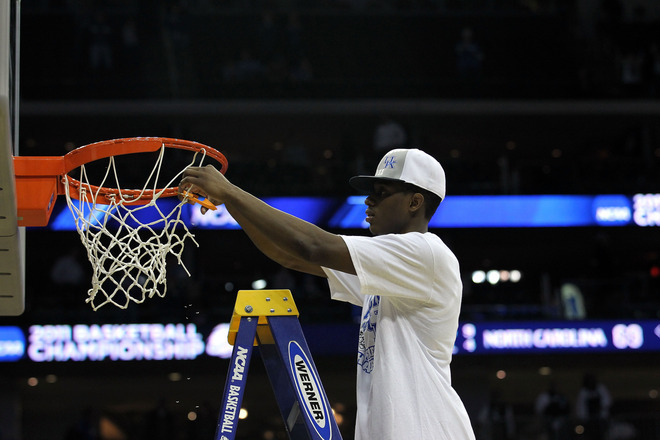 Like Duke in the ACC tournament, the Wildcats took UNC’s best shot and kept knocking down big baskets to hold them off. The Tar Heels fell behind in the first half and sustained a long second-half rally, but the Cats simply hit big shot after big shot to hold off the ACC regular season champs. With #2 North Carolina’s loss, the NCAA Final Four will be without a #1 or #2 seeded team since the tournament expanded to 64 teams in 1985. Brandon Knight scored 22 points and fourth-seeded Kentucky advanced to the Final Four for the first time since their 1998 national title. Even with UNC defensive stalwart Dexter Strickland glued to him, Knight continues to make game changing shots as he has done all tournament long. The Wildcats made 12 of 22 three-pointers, a whopping 55% as part of 48% overall shooting. The Tar Heels shot 42% and made only 3 of 16 (18%) from behind the arc. A season after falling a game short of the Final Four behind a roster filled with future NBA stars, the Wildcats are heading to the national semifinals for the 14th time behind the heady play of Knight and Harrellson’s emotional leadership. the Tar Heels fell behind early and struggled to keep the hot-shooting Wildcats in check. John Henson picked the wrong day to play poorly (4 points, 9 rebounds, no blocks) and was in foul trouble most of the game.